I remember when I was a little girl and I absolutely refused to eat the yolk of an egg. My Mom would always cook our eggs sunny-side-up, the yolk medium set. My little hands would cut around that yellow-orange mystery ball with incredible precision, being ever so cautious to ensure that the whisper-thin seal did not break, pouring over my silky-sheen egg white and subsequently ruining my breakfast. I was just a little foodie-girl then and clearly had oh-so-much to learn about this incredible, edible superfood. Now I covet that delicate, domed center, fully aware of the magic it can lend both on it’s own and as a critical element of countless dishes. Eggs are not without a checkered past, accusations of high-cholosteral still a small blemish on their white shell. No longer misunderstood, they are being celebrated, adding that special something when placed atop pasta, creating a luscious dressing when broken over a salad and offering up the ideal sauce for a bed of freshly cooked lentils. When I was planning the menu for my and Z’s fifth anniversary celebration, I knew that a loosely-set egg yolk had to be incorporated. Having just returned from Croatia, we were fully stocked with an assortment of truffle delicacies, and my mind quickly turned to Uova da Raviolo, a traditional Italian ravioli filled with ricotta and the whole yolk of an egg. 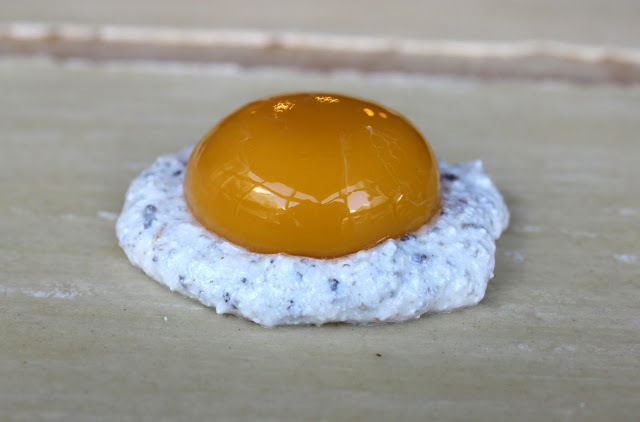 Cooked gently, the yolk manages to stay intact, broken only when your fork pierces the delicate pasta, releasing the yolk which in turn bathes the truffle-spiked ricotta and pasta in a rich and delicious, natural sauce. Sounds fancy, doesn’t it? Well it is… and it is equally as easy. Yes it takes some attention and a delicate touch, but it is a dish of only a few elements, each allowed to shine in this perfect pasta pouch. I am so thankful that I grew out of my egg-yolk misgivings. Just think of all I would be missing out on – Uova da Raviolo to start. One of the highlights of our Istrian adventure was, without a doubt, hunting for truffles. More to come on that amazing experience in next week’s post. In the meantime, PLEASE do not think truffles are a critical element of this dish. It is indeed a luxury ingredient and can be found at some specialty stores or ordered on line. But you can add flavor and depth to the ricotta base with a variety of other items such as chopped, frozen spinach (defrost, squeeze in a clean dish towel until all of the water is removed and fold into the ricotta) or the additional of another cheese such as grated parmesan or finally shaved taleggio. Tonight we were celebrating five years of happy, happy, marriage and we were going to make good use of our Croatian truffle paste. Combine six tbs of whole milk ricotta with one and one half tbs black truffle paste, one eighth of a tsp red pepper flakes, the juice of one half of a lemon, one quarter tsp kosher salt and one eighth tsp freshly ground black pepper. Stir gently to combine. Lay out two sheets of fresh pasta dough, one to act as the base of the raviolo and the other as the top. I highly recommend giving my handmade pasta a try – recipe found here – but you can also find fresh pasta sheets at specialty food stores such as Lotsa Pasta in Louisville. Place individual tablespoons of the truffle-ricotta mixture in the middle of the pasta sheet, spacing evenly. You will have enough ricotta for six ravioli. Use the back of a spoon or your finger to make a small dip in the ricotta mound. Carefully place an egg yolk in each divot of ricotta. Brush the edges of the pasta dough with water, creating a border around the ricotta and egg. Do the same thing with the top sheet of dough and carefully place it over the eggs. Press gently at the seams of each raviolo to seal the individual pouches. Slice the ravioli into individual squares and set aside. Bring a large pot of water to a boil and season with a palm-full of salt. Gently place the ravioli into the water and cook for two to three minutes until the pasta is just cooked through. You may have to do this in two batches, depending on the size of your pot. You don’t want to overcrowd the pasta. While the ravioli is cooking, warm butter in a small pan until melted (use one tbs of butter per raviolo). Add one tsp of truffle paste per three tbs of butter and stir gently until blended. Remove the ravioli to a plate and drizzle the truffle butter over the warm pasta. Top with freshly grated parmesan cheese and minced basil. Serve immediately. Combine the ricotta with one and one half tbs black truffle paste, one eighth of a tsp red pepper flakes, the juice of one half of a lemon, one quarter tsp kosher salt and one eighth tsp freshly ground black pepper. Stir gently to combine. Lay out two sheets of fresh pasta dough, one to act as the base of the raviolo and the other as the top. Place individual tablespoons of the truffle-ricotta mixture in the middle of the pasta sheet, spacing evenly. You will have enough ricotta for six ravioli. Use the back of a spoon (or your finger) to make a small dip in the ricotta mound. Carefully place an egg yolk in each divot of ricotta. Slice the ravioli into individual squares and set aside. Bring a large pot of water to a boil and season with a palm-full of salt. Gently place the ravioli into the water and cook for two-three minutes until the pasta is just cooked through. You may have to do this in two batches, depending on the size of your pot. You don’t want to overcrowd the pasta. *One of the highlights of our Istrian adventure was, without a doubt, hunting for truffles. PLEASE do not think truffles are a critical element of this dish. It is indeed a luxury ingredient and can be found at some specialty stores or ordered on line. But you can add flavor and depth to the ricotta base with a variety of other items such as chopped, frozen spinach (defrost, squeeze in a clean dishtowel until all of the water is removed and fold into the ricotta) or the addition of another cheese such as grated parmesan or finally shaved taleggio. This sounds amazing! I'm definitely a sucker for a beautiful yolk! Runny egg yolks and pasta, two of my favorite things. I absolutely love this idea. I am sure a very delicate hand is required for this. Very impressive! Thanks Chris! I appreciate your kind words and would love your feedback once you give it a try!